If you have a website that takes payments or processes customer data then you will no doubt know that your site needs to be secure through the implementation of an SSL certificate. However this is now something that all site owners need to get to grips with because Google is pushing for this to be standard across all websites. 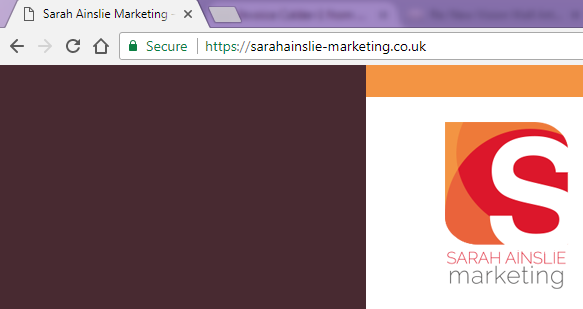 You can see whether a site has it or not because its URL will begin with https:// rather than http:// without the ‘s’. Chrome v62 has been released this month and it is now marking sites that do not have an SSL certificate as ‘Not Secure’. This is done in the address bar of your site, to the left of your URL. You can see in the image below how sites that don’t have an SSL certificate are being flagged. And this is what a secure site with an SSL certificate looks like. It’s not clear yet whether Google will penalise sites in their rankings for not being secure however, if for good practice and the negative perception that it may create for visitors to your site alone, it really is something that you should do. If you collect any kind of data through your site, even something as simple as a contact form, then you really should have an SSL certificate. I am advising all my clients to implement this. How much will SSL certification cost? It will vary from provider to provider but generally speaking you will expect to pay something in the region of £50-£60 for the initial implementation and an annual fee of £30-£40 thereafter. Who can implement an SSL certificate? This is a technical task so you will need to speak to your web developer or host. What if I don’t bother with an SSL certificate? You may think you don’t really need one because you don’t process any kind of data but for the sake of £60 do you really want to get on the wrong side of the biggest search engine in the world? 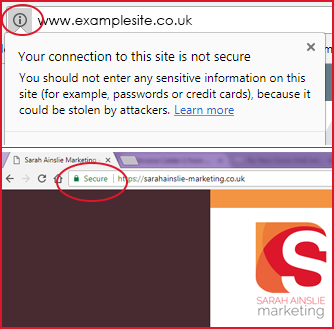 It may not be making an impact on ranking now but it is entirely feasible that it could and it’s going to be difficult to instill customer trust in your organisation when your site carries a warning saying ‘Your connection to this site is not secure’. (BTW, I am not touting for business on this – it’s not something that I can offer, just in case the old cynic in you was wondering! ).